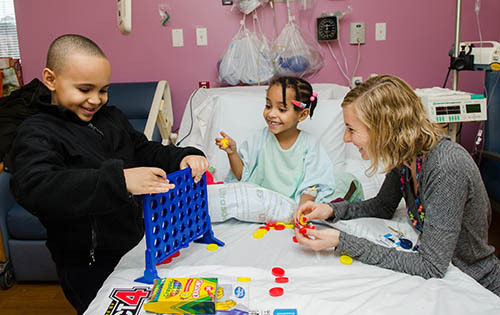 The Child Life Program at NewYork-Presbyterian Brooklyn Methodist Hospital provides emotional and psycho-social support to children and families that promotes coping with visits to the emergency room, inpatient hospitalization and illness. Developmentally appropriate preparation for tests and procedures. Distraction and emotional support during procedures. Introduction of positive coping techniques to face the challenges of illness and hospitalization. Therapeutic play and self expression activities to promote development and normalize the hospital environment.